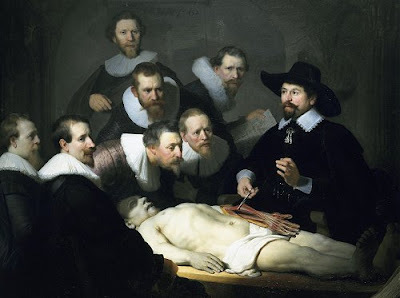 Among those in Amsterdam in 1651 watching the public dissection of a corpse captured in Rembrandt's The Anatomy Lesson was thought to be the Norwich based writer, philosopher and physician Sir Thomas Browne. My thanks go to the many kind readers who sent messages following my recent somewhat less public surgery. On Monday evening I flew back to the UK and my appreciation goes to Ryanair whose treatment of me as a wheelchair passenger was exemplary. Appreciation also goes to the medics at La clinique Médipôle Saint-Roch à Cabestany - Perpignan in France for their speedy intervention. I wish I could also praise the post-operative care I received at this clinic, but sadly I cannot. At this private hospital I experienced a disturbing mix of Gallic arrogance and ineptitude overlaid with American-style corporate crapola. La clinique Médipôle Saint-Roch à Cabestany - Perpignan is owned by international private equity group Bridgepoint which also owns a leading independent provider of health care services to the UK's National Health Service. Before David Cameron proceeds with his plans to publicly dissect the NHS I recommend he undergoes a complex appendectomy at La clinique Médipôle Saint-Roch à Cabestany - Perpignan. W.G. Sebald's The Rings of Saturn is a profoundly moving meditation on surgery, Sir Thomas Browne and things we have lost. William Alwyn's magnificent Fifth Symphony is dedicated to Sir Thomas Browne. Doubtless Bridgepoint, or more probably their PR consultants, will pick this article up via Google alerts. Before they contact me I would ask them to speak to two members of the quality and patient care commission at La Cinique Médipôle Saint-Roch à Cabestany-Perpignan. Both M. Philippe Aulombard (Directeur) and Mme. Christine Pascot (Surveillant générale de l'établissement) were sent by hand prior to my departure from France hard copies of a detailed report of my experiences, complete with photos. To date neither has had the courtesy to even acknowledge receiving my complaints. Report broken links, missing images and errors to - overgrownpath at hotmail dot co dot uk Also on Facebook and Twitter. Rembrandt painted this subject twice. Browne was in Leiden circa 1629 when the earlier of the two paintings were composed. It's possible however that Rembrandt may have added figures from the earlier work to the latter. Yes, there are problems at the clinic in Cabestany and the staff are now on strike over working conditions and patients are being transferred to other hospitals.